The city of Graz is the capital city of the Austrian federal state of Styriain and the second largest city in Austria. This industrial city has a very pretty preserved historic city centre. Electric trams started here in 1899 and today, though owned by the city are operated by Graz Linien, who also operate the bus network. There are eight routes on standard gauge track of 1,435mm. At the time of filming, in September 2016, this interesting tram fleet consisted of trams manufactured by SGP, Bombardier (Flexity Outlook Cityrunner) and Stadler (Variobahn). Our filming begins in the city centre. Starting on the Erzherzog-Johann Bridge and moving along to Murgasse, Hauptplatz, Herrengasse, Am Eiseman Tor we end up at the busy transport interchange at Jakominiplatz. There is plenty of action for you to view, with all types of trams seen in service. 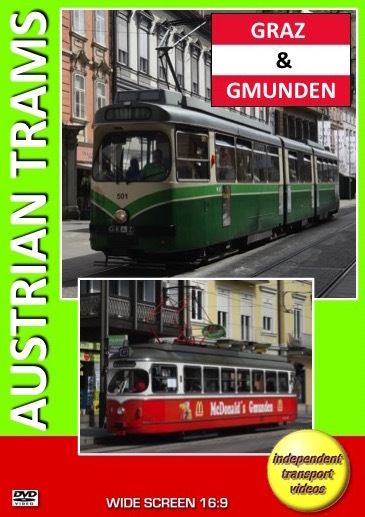 Our first journey is on SGP GT8, tram 502 on line 4 to Andritz. From here we take Stadler Variobahn tram 242 on line 5 to Maut Andritz where we change to 612, a newer type of SGP GT8 tram with a low floor centre added, on line 5 to Sackstraße for further filming in the city centre. Our next location is within the Hauptbahnhof, where we see the trams running under the station. To complete our visit to Graz, we board tram 660, a Bombardier Flexity Outlook Cityrunner on line 3 for a brief ride to Südtiroler Platz. This tram makes an interesting comparison with the other trams we have ridden on during our visit to this very smart fleet and city.